Michelle: Fry, why must you analyze everything with your relentless logic? 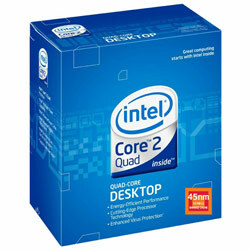 The Intel Core 2 Quad, is as the name implies a Quad Core processor produced as part of the Core 2 family of processors from Intel. The Q9550 presents itself as a mid to high level processor and does not disappoint. Offering a 2.83 GHz clock rate over each core, this processor is a true powerhouse right out of the box. Combine this processor with an operating system and application suite that is optimized for a four core system and your computer will be waiting for you to do something rather than the other way around. The Q9550 boasts an impressive array of specs, the first and foremost of which is a 2.83 GHz clock rate providing an impressive amount of raw computing power. It also features a 1333 MHz front side bus, 12 MB L2 cache, 45 nm construction, support for both 64 bit operating systems and virtualization, add on to that buffer over flow protection and a 3 year warranty and that is one impressive looking processor, or so someone told you. Yes those specs are really good, but what do they mean in practicality? Essentially what those specs mean to the average user, is that the processor will act like less of a bottle neck in terms of computing operations. The front side bus and the clock rate allow for data to get sent to and from the processor at rates fast enough to keep the processor busy and not waiting for the data rate to catch up to it. This means even under a heavy workload you will still be enjoying using your computer rather than wanting to throw it out the window. As with any processor, it has to work in tandem with the motherboard. For the case of the Q9550, even though the socket type of LGA 775 is fairly common make sure to double check with the motherboard manufacturer to verify that your processor will be compatible. Finally, with the release of the Core i7 processor family, drops in cost have already become common meaning that you can pick up this reliable processor for a reasonable price yet still enjoy a high end performance. This list is composed of Motherboards certified by manufacturers for being compatible. It is by no means all inclusive, but rather just a good starting point for finding a solid compatible motherboard that meets what type of computer you want to build. The list is alphabetical from some of the larger manufacturers. The motherboards themselves are ordered by customer ratings. As always, feel free to leave any questions or comments you have!